This is part three of my first unit for Geometry. You can go back and read about part one and part two. My students came to school with lots of questions about their homework. So, I made up this page on the fly before we started the new lesson. I think this is the bones of a good page. 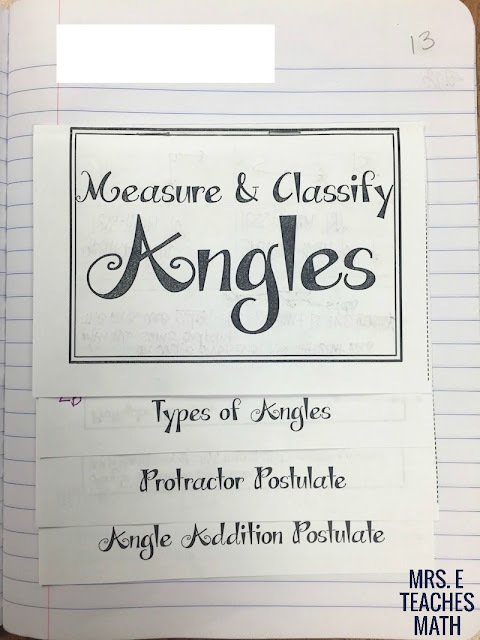 I want to do the same thing next year, but I will have the diagrams printed so the kids can glue them in. It’s so hard to freehand decent-looking diagrams in the interactive notebook. This page has my foldable for angle pair relationships. I didn’t talk about the tabs in order. 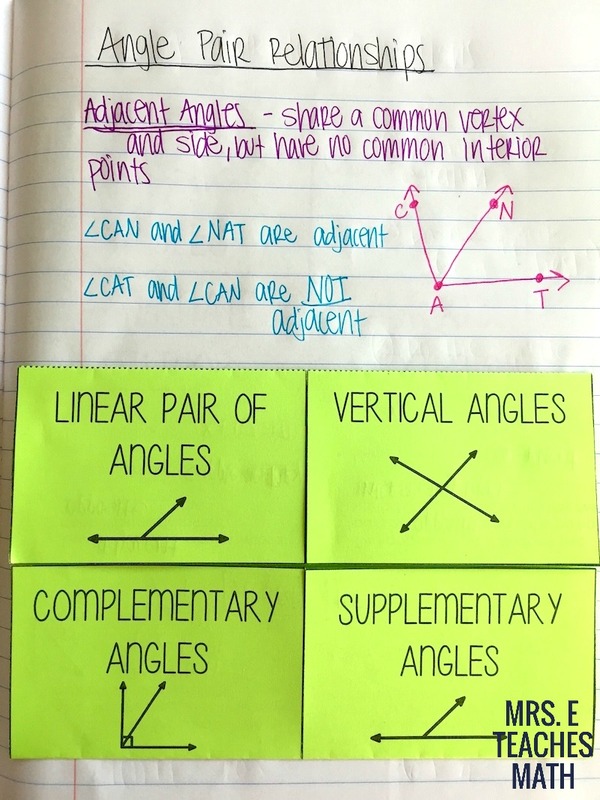 First, I talked about complementary angles, then supplementary angles. Then, I moved the the top tabs. The last page for the unit was this Angle Relationships Error Analysis worksheet. 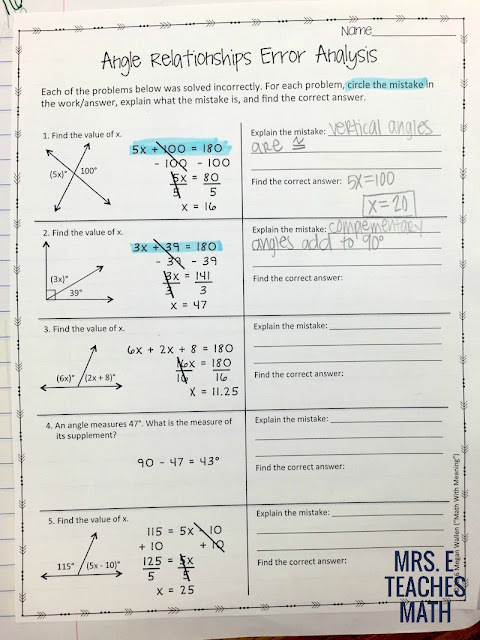 We did this worksheet together and my kids did a super job finding the error. I wanted to explain the mistakes only using true statements. I didn’t really explain this to the kids, but I was trying to create muscle memory and pave the way for proof writing. After this, there is a quiz, review, and the test. That’s it! As we went through the unit, I ended up adding a few more pages than I planned originally. It makes me a little nervous that I’m going to run out of room before the end of the school year. 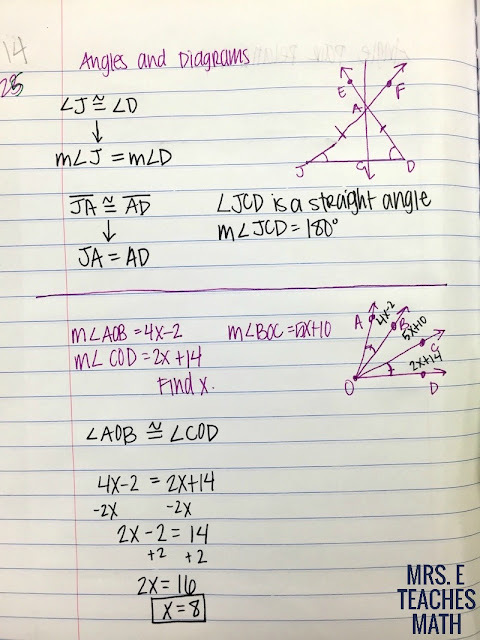 Thanks for sharing my Angle Relationships Error Analysis! So glad you were able to use it. Looks like you've got a great unit plan - I love that you're sharing what you did each day!